KABUL, Afghanistan — Several hundred Afghan and international dignitaries are expressing their sympathies to Afghan President Hamid Karzai, whose half brother was assassinated this week at his home in southern Afghanistan. 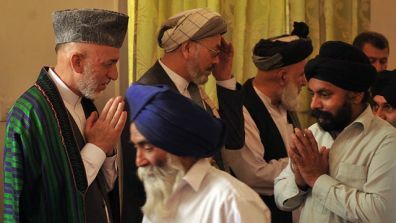 President of Afghanistan Hamid Karzai, left, greets Sikh elders during a funeral for his late brother Ahmad Wali Karzai at the Presidential Palace in Kabul, Friday, July 15, 2011. They joined Karzai on Friday for a prayer service in a mosque at the palace, sitting cross-legged on rugs to remember Ahmed Wali Karzai, a powerful and controversial man in Kandahar province and throughout the south. Tuesday’s slaying of Wali Karzai left the president without a powerful partner and threatened to create a power vacuum in the spiritual birthplace of theTaliban. Gen. David Petraeus, U.S. Ambassador Karl Eikenberry and U.N. envoy Staffan de Mistura attended along with Afghan ministers, lawmakers and military leaders.